Dr Alex Moulton CBE RDI FEng (born April 9th 1920) is a highly respected English engineer and inventor, renowned worldwide for his expertise in suspension design. The great-grandson of the rubber pioneer Stephen Moulton, he was educated at Marlborough and later at King’s College, Cambridge where he graduated in Engineering. During the Second World War he was employed in the Engine Research Department of the Bristol Aeroplane Company where for two years he was personal assistant to Sir Roy Fedden, the Chief Engineer. After the War he joined the family rubber company, Spencer Moulton and Co., where he became technical director and established a research department specialising in rubber suspension systems for vehicles. In the late 1950s the family business was sold to the Avon Rubber Co. and Dr. Moulton founded Moulton Developments Limited to concentrate on creative design and suspension systems for vehicles. One of Moulton’s notable achievements from this period was the design, development and production of the suspension system for the iconic Mini, designed by his friend Sir Alec Issigonis. The combination of conical rubber springs and small wheels was one of the many innovative developments which allowed Issigonis to achieve the Mini’s overall small size. 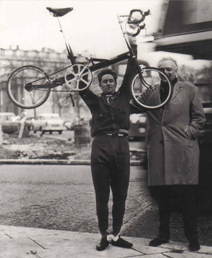 In 1956, inspired by his automotive developments and prompted by the oil shock caused by the Suez Crisis, Dr. Moulton started work on the small wheeled bicycle and eventually in 1962, at the Earls Court Cycle Show, the first Moulton Bicycle was launched. 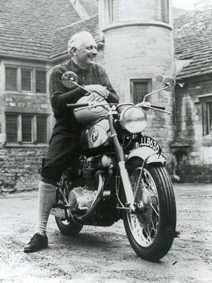 British Designed & BuiltGiven Alex Moulton’s background in aeronautical and automotive engineering, it is perhaps unsurprising that his bicycle design ethos was, in the late 1950s, completely at odds with the accepted norms of the cycle industry. 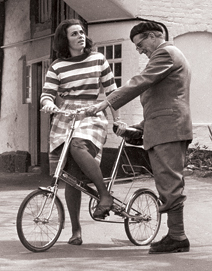 His development activities extended to construction methods and, whilst many of these are commonplace nowadays, the large section tube, extensive use of pressings and lugless construction of the original Moulton bicycles were quite revolutionary in 1962.Whilst Moulton bicycles of today are of different appearance and construction to the original models, the ethos of improved ride comfort, high performance, convenience and practicality in use is still the same. It is noteworthy that the space-frame Moulton, some twenty-five years after initial launch, is still regarded as a novel and interesting design and its performance compares favourably with modern diamond frame bicycles. Of course, the latest Moulton models have considerably evolved since then and offer improvements in every area of performance and comfort.Strong parallels can be drawn between the evolution of the Moulton bicycle and research undertaken by Moulton Developments Ltd. in other fields. The rubber suspension systems used on the bicycle owe much to the Moulton automotive suspension systems used on the Mini, the MGF and over fifteen million British motor cars built between 1959 and 2000. This pioneering work in independent suspension placed greater demands upon chassis stiffness and these new design requirements eventually led to the space-frame construction of the Moulton coach. The original Moulton Bicycle was launched in 1962 at the Earls Court Cycle Show, as a revolutionary fresh take on the classic bicycle. 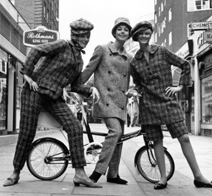 It soon became an icon of the swinging 60s seen as a fashionable mini-bike to go with mini-skirts and mini cars. Alex Moulton had originally interested Raleigh in manufacturing the Moulton bicycle, but after negotiations broke down he formed Moulton Bicycles Ltd and started building a bicycle factory in Bradford-on-Avon. Reaction to the new bicycle was so positive that Alex immediately ordered the factory to be doubled in size, but even this proved to be woefully inadequate to meet demand and a manufacturing operation was established at Fisher & Ludlow, a subsidiary of the British Motor Corporation. Within a year, Moulton Bicycles became the second-largest frame builder in the country (after Raleigh). 1965 Having seen the roaring success of the Moulton bicycle, other manufacturers were keen to grab a slice of the market with their own small wheeled cycles. Although many features of the Moulton bicycle were protected by patents, other cycle companies devised designs that, whilst having a similar appearance, were wholly inferior in performance and comfort. The most significant of these was the Raleigh RSW16 which, with its low-pressure balloon tyres, looked comfortable but was hard work to pedal. Even today, small-wheeled cycles are tarnished by the memory of the atrocious performance of the RSW16 and similar bicycles. To counter this, Alex Moulton was keen to improve the reputation and popularity of the small wheel in ‘club cyclist’ circles and launched the Moulton ‘Speedsix’ – a uniquely versatile racing and touring bicycle with a six speed derailleur gear (previously, all Moulton bicycles had been fitted with internal hub gears. The ‘Speedsix’ was the first mass-produced bicycle of any type to be fitted with a six speed derailleur gear). Shortly afterwards, in 1966, the Moulton ‘S’ Speed – a true racing bicycle with double chainrings, short wheelbase and Reynolds 531 lightweight tubeset. 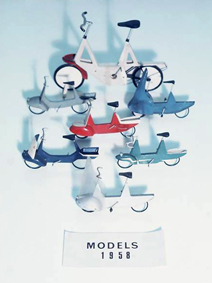 As competition in the small-wheeled bicycle market intensified, and Alex Moulton was increasingly involved in the automotive industry, in 1967 the decision was taken to accept an offer from Raleigh to buy the Moulton bicycle business. Alex Moulton retained an active role as a consultant within Raleigh but, whilst the combination of Raleigh’s manufacturing expertise and Moulton’s innovative design appeared to be excellent news for both parties and the Moulton bicycle, it remained an uneasy alliance. With Raleigh taking care of manufacturing, Alex was able to devote more of his time to developing and improving the Moulton bicycle. A revised ‘F’ frame design, with a triangulated rear fork, was the result and after a series of high performance prototypes (including Colin Martin’s England to Australia Moulton Marathon) this was launched in 1970 as the Moulton MkIII. Raleigh introduced the ‘Chopper’ at the same time and this stole most of the limelight. Sales of the MkIII were poor and Raleigh did not introduce any further models to supplement the current single utility orientated model. In 1974, with sales figures seemingly in terminal decline, Raleigh ceased production of the MkIII and the collaboration between Raleigh and Moulton came to an end. Alex Moulton continued develop the bicycle, this time with a shift in emphasis from mass-production to high quality hand built performance machines. With his innovative ‘Y’ frame (witness how common this frame configuration has become for mountain bikes) model nearly completed, a casual remark by a friend about the apparent weight of the ‘Y’ frame led to a complete re-think. In 1977 Alex conceptualised the spaceframe Moulton – which reconciled the seemingly unsolvable demands of the open, stiff frame and the need for lightness – and the iconic architecture of the Moulton bicycle, hitherto following a progressive, evolutionary path, changed forever. By 1979, the new spaceframe bicycle had reached a definitive stage, and production plans were put in place. The original bicycle factory was re-equipped and, following exhaustive testing, the ‘Alex Moulton’ (‘AM’) bicycle was launched to immediate acclaim in 1983. The AM7 gained great respect from the cycle touring community as a superb touring machine. 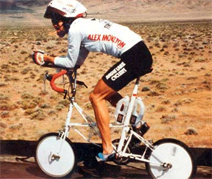 1985 saw an increasing emphasis on performance – in a similar fashion to the record breaking feats of the original ‘F’ frame Moulton, Alex sought to prove the performance advantages of the Moulton bicycle concept. 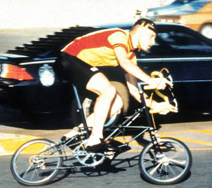 A clear lexan fairing by Zzip Designs became available as a factory option and further work with aerodynamicist Doug Milliken resulted in a fully faired AM bicycle. In 1986 Jim Glover rode this bicycle at 51mph on a flying 200 metre course to set a world speed record that stands to this day. 1987 saw the 25th anniversary of the Moulton bicycle and the introduction of the innovative ‘Wishbone’ adjustable handlebar stem on the AM ‘Jubilee’ model. Another sideways step in evolution took place in 1988, with the AM-ATB off road bicycle. Based upon a rationalised AM spaceframe design with 20″ wheels, and credited as the first full-suspension mountain bike, the AM-ATB found favour in North America as the mountain bike boom took off. 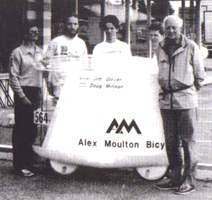 In 1989, following the success of AM rider Dave Bogdan in the Race Across America, the AM-SPEED was launched at the annual meet of the Moulton Bicycle Club in Sept 1989. A non-separable racing version of the AM bicycle, the AM SPEED was the lightest production Moulton yet. 1992 saw another significant development with the introduction of the Moulton APB (All Purpose Bicycle), manufactured under licence by Pashley Cycles in Stratford-upon-Avon. The APB, developed from the AM-ATB, was, as it name suggested, for the rider in city, town or country; on good roads or bad. By utilising a simplified frame design and streamlined manufacturing techniques all the advantages of the Moulton system became available at a much lower price. In 1998, fifteen years after the introduction of the AM space frame, the New Series Moulton was launched which was equipped with a radical new suspension system and benefited from further weight-saving making a faster and more comfortable performance machine. Whilst sharing the architecture of the now legendary AM series, the flexitor and hydrolastic suspension systems of the NS offer increased refinement and improved ride comfort. Many Moulton enthusiasts experienced a ‘turn of the century’ when, in collaboration with Japanese giant Bridgestone, the ‘Bridgestone-Moulton’ bicycle was introduced in the year 2000. Constructed from aluminium, the model marked a return to the classic ‘F’ frame design and most closely resembles the original Series One last seen in 1965. Manufactured in the Japan in separable or fixed frame versions, the Bridgestone is the only model built outside of the UK since Raleigh South Africa produced ‘F’ frame models under licence in the 1960s. 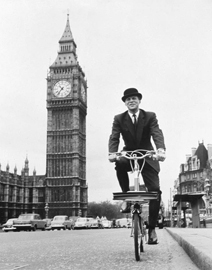 1962- only a month after the Moulton was launched, John Woodburn spectacularly broke the Cardiff to London record on a Moulton ‘Speed’, covering 162 miles at an average speed of 24 miles per hour. This feat immediately established the Moulton as a serious bicycle amongst the public, the press and the cycling community. 1963 – a four-man pursuit team, riding Moultons at The Butts track in Coventry, catch their opposition and break the club record. 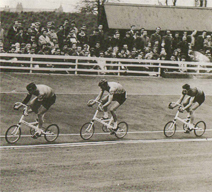 1963 – One of Britain’s cycling greats, the late Tom Simpson, test rode the Moulton Speed at Herne Hill in London. He was so impressed by the bike that he stated he would be pleased to race on the small-wheeler ‘next week’ were he not already under contract to Peugeot. 1967 – Vic Nicholson breaks the Cardiff to London (new route over Severn Bridge) record on Moulton ‘Speedsix’. 1978 – Daved Sanders completes the Paris-Harrogate 800km Centenary Ride in only 51hrs. Daved was one of only 32 finishers from an entry of 108. 1984 – Elgar Vaivars wins Toronto Criterium on AM7 taking full advantage of the superior cornering capabilities of the Moulton. 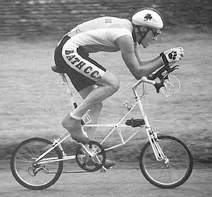 1985-1986 – In the Autumn of 1985, at the International Human Powered Speed Championships, a fully-faired Moulton ridden by Jim Glover broke the 200 metres flying start speed record, at 50.21mph (80.79kph). Then on August 29th 1986, at the same event, he broke his own record at a speed of 51.29mph (82.54kph) which still stands today for the conventional riding position. The Moulton ridden was an AM SPEED with the fairing designed by Doug Milliken of Buffalo, NY. 1987-88 – Dave Bogdan rode the ultra-endurance Race Across America (RAAM) in 1987 on a pre-production AM-Jubilee, and in 1988 on a prototype AM SPEED. His 1987 time was 11 days, 8 hours and 2 minutes. In 1988 he improved on this by completing the 3,073m (4,944km) route in 10 days and 15 hours and 1 minute, averaging 289 miles (465 km) per day. He finished 8th out of 35 starters in what is not only the toughest, longest ‘single stage’ race in the world, but also the ultimate test of man and machine. 1989– Richard Grisgby of the Bath Cycling Club, riding an AM SPEED, came first out of 180 in the 1990 Fowey Triathlon in Cornwall. He also came third in the cycling split of the Kingswood Triathlon out of some 400 competitors and was only 9 seconds behind a 1st category roadman. 1991 – Gerry Tatrai wins the 24 hour HPV race around the Milwaukee Mile Track, Wisconsin USA. 2001 – Dan Farrell (on NS SPEED) completes the world’s longest randonnee, the 1400km London-Edinburgh-London in 100 hours. 2003 – Chloe Williams (on NS SPEED) completes Paris-Brest-Paris, a 1200km randonnee, as youngest female finisher and wins the Audax UK Merit Trophy for most outstanding cycling performance of the year. Dan Farrell rides PBP on prototype TSR. 2007 – Kazuhiro Yamamoto on a NS Double Pylon finishes 6th out of 320 in a 4 hour solo class at Suzuka, Japan. 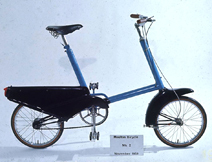 In 1970, the Moulton Marathon, one of the MK3 prototypes, was ridden by Colin Martin from Wiltshire, England to Kalgoorlie, Western Australia. Only four Marathons were made. Colin’s was sadly stolen in Australia, terminating what was intended to be a round-the- world-tour. Whilst waiting for a replacement to be built and sent out to him, he met his future wife and chose to settle in Australia. 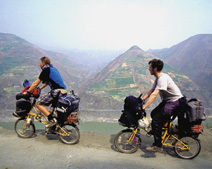 In 2002 he continued his tour on a New Series Moulton, riding from Vancouver to Bradford-on-Avon, and in 2008 he finally completed his epic journey in Australia. 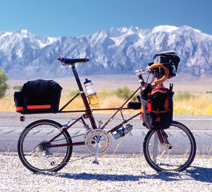 To learn more of Colin’s epic adventures on his Moulton, visit www.greenbicycle.com. Before Ron got his AM7 Moulton he was a leisurely tourist quite content with 100km in a day. But he found “this lovely machine was so responsive, so compliant, that I was soon doing 200km and 400km Audax rides in comfort and enjoying the experience enormously”. In October 1984 Ron rode his AM7 1,740 miles (2,800 km) west from Adelaide in Southern Australia, to Perth in Western Australia, following the Eyre Highway. The ride included a 1,200 mile (1,930km) stretch across the Nullarbor Plain. He completed the journey in 19 days averaging more than 90 miles (145km) a day. Cambridge graduates, Ben Steele, Oliver Matthew and Baz Bix, chose Moulton APBs to ride across Mongolia and China following in the tracks of a 1874 Russian Research and Trading Expedition. Setting off from Ulan Ude in Russia, they encountered extremes of climate and terrain conditions passing through the sands of the Gobi desert and heights of the Tibetan plateau. They arrived in Zaisang on the China/Kazakhstan border, after travelling an amazing and eventful 6000 miles (9650 km). BBC journalist, Steve Jackson, rode a Moulton APB from ‘End-to-End’ of New Zealand (Bluff to Cape Reinga) in 2002, covering 1800 miles (2900 km). The tour took four weeks and included the punishing road to Milford Sound, and the mighty Crown Range Road – at 3,670′, the highest road in New Zealand. As well as the excellent ride comfort, Steve found the Moulton separability ideal when transporting the bike in small aircraft. The Moulton Bicycle ClubThe Moulton Bicycle Club was founded in 1975 for worldwide devotees of the Moulton.The unique design and performance pedigree of the Moulton has become so widely respected and enjoyed. Today the club has members from around the globe, many of whom meet and camp at Bradford-on-Avon for the annual ‘Moulton Weekend’ each September. Similar events are organised by Moulton distributors in Japan and Taiwan.The club regularly publish the ‘Moultoneer’magazine to keep devotees up to date with Moulton news and to provide useful information on Moulton preservation.For more information on the club visit Moulton bicycle club. 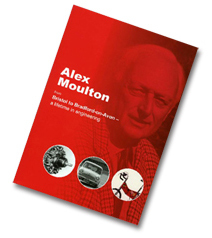 – A Lifetime In Engineering (Alex Moulton)You can purchase any of these books direct from the Moulton factory. Please call +44 (0)1225 865895.